Posted on July 15, 2015 by Barry V.
Everything was wet on the Flat Rock Trail when I started out this morning. Heavy thunderstorms the previous evening had supplied the area with some much needed moisture. 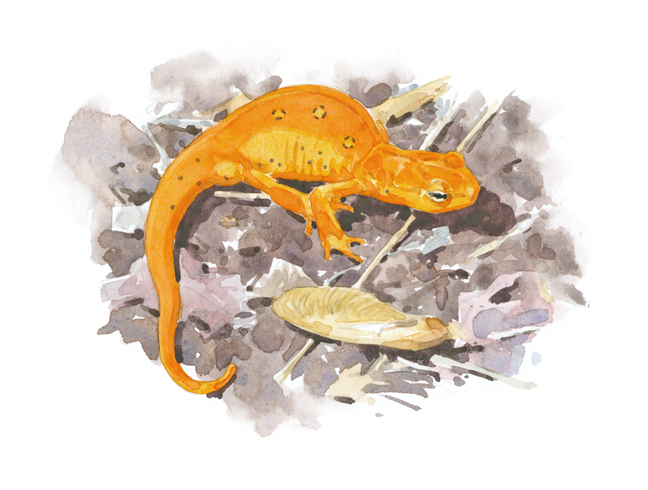 The dampness brought out frogs and salamanders, and I found several lovely red efts along the trail, one of which I decided to paint. Note the winged maple seed (or samara), which gives a sense of scale. Views of Burncoat Pond proved challenging, with only a few points along the shore allowing any access, but I started a watercolor nonetheless. My view was looking down into a marshy bay of the lake, through a screen of dead timber. It was a complicated scene. Too complicated, as it turned out! I couldn’t manage to resolve the special relationships, and about halfway into the painting realized that it was going nowhere. I put it away, deciding not to waste any more time on it. Not all field paintings work out, and sometimes the trick is knowing when to quit! I headed back to the parking area for lunch. I had noticed on my way to the pond that the large meadows around the parking area were rich in birds, and I wanted to spend more time there. While eating lunch under a big sugar maple near the parking area, a bird flew into the branches over my head. Something about the bird looked interesting, but I couldn’t locate it among the sugar maple leaves. 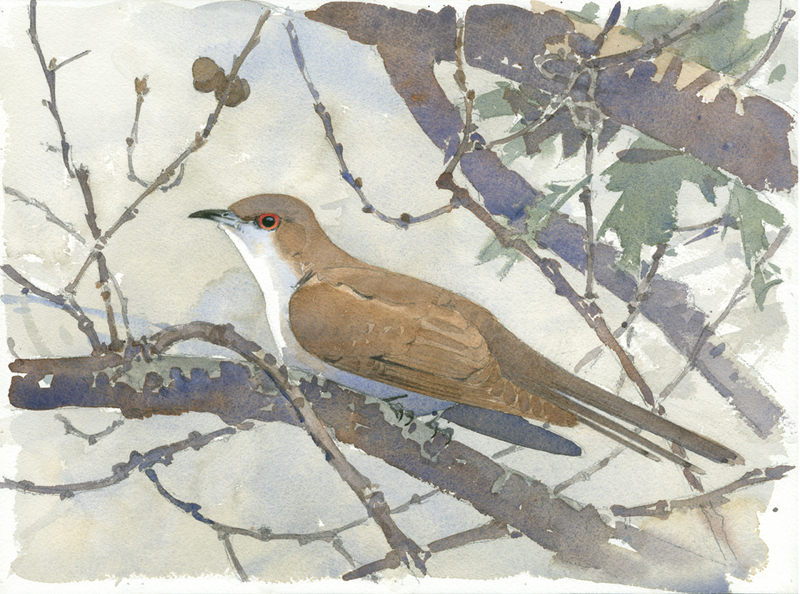 Finally, it flew to an oak across the road and I quickly got my scope on it – a black-billed cuckoo! Good looks at cuckoos never seem to last very long, and this one was no different- giving me just one good look before it disappeared. I rarely try to develop a painting from such a brief look, but the impression I’d had was a strong one, so I scribbled some lines in my sketchbook to get down as much as possible of what I remembered. Then I took out a sheet of watercolor paper and sketched the oak branches where the bird had been sitting (the branches were still in my scope view). Later, back in the studio, I refined my drawing and finished the piece. I’ve learned that it’s sometimes good to force myself to work from memory – it has a way of distilling and intensifying a field experience! Hiking up the section of mid-state trail a short ways, I got much longer looks at an indigo bunting. I must have been near a nest, because the male circled and scolded me from low perches along the trail. I did a page of studies, and later, a small watercolor in my studio. In good light, the blue of an indigo bunting is unearthly! I found that the best mixture was Thalo blue (a very strong, staining blue) softened with just a touch of ultramarine. 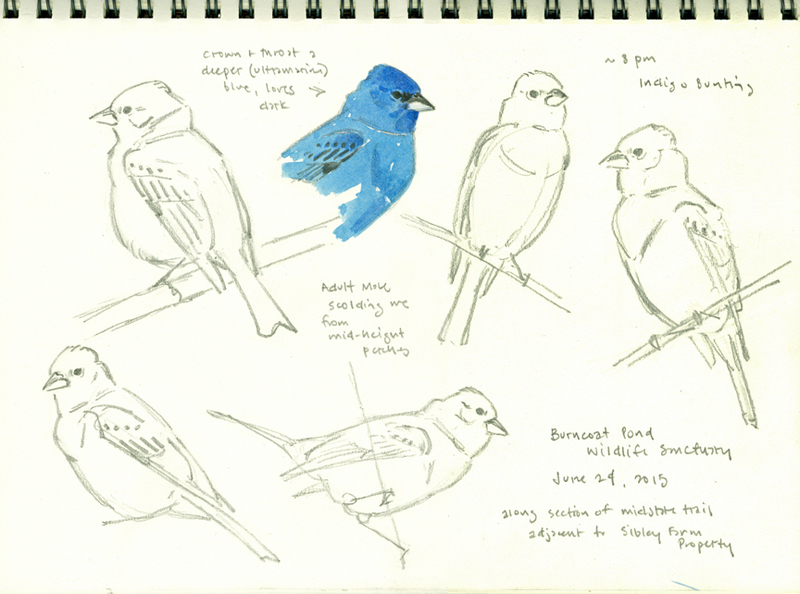 The darker blue on the bird’s head and shoulder is pure ultramarine. A background wash mixed from raw sienna and ivory black intensifies the bird’s color. 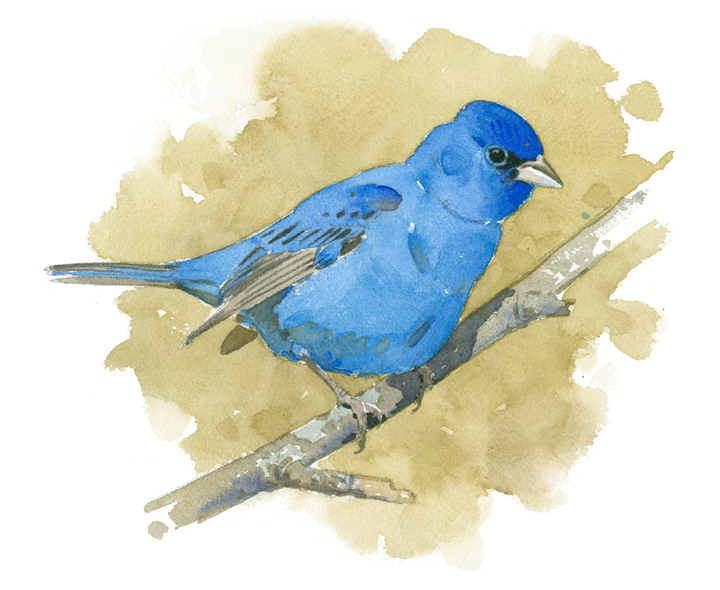 This entry was posted in Artists, Barry Van Dusen Residency, News and tagged Barry Van Dusen, Birds, Black-billed Cuckoo, Burncoat Pond, Burncoat Pond Wildlife Sanctuary, Flat Rock Trail, Indigo Bunting, Maple Samara, Maple seed, Red eft, Salamander, Watercolors, Wildlife Sanctuary on July 15, 2015 by Barry V..